Threats to Survival: Contamination; overfishing and conflict with fishermen; infrastructure such as roads and hydroelectric dams. 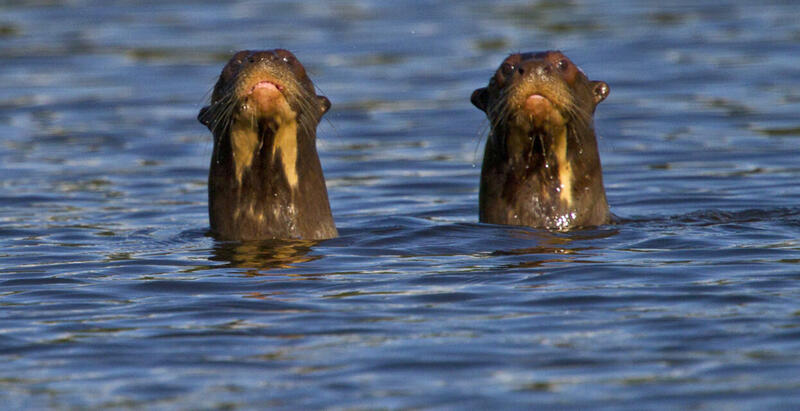 Giant otters are large aquatic carnivores that inhabit rivers and seasonal lakes in South America. They live in family groups, composed of 2-15 individuals, including a dominant breeding pair, non-breeding subadults, and offspring. Our conservation research program for giant otters is aimed at understanding the effects of emerging anthropogenic threats in the Peruvian Amazon on giant otter populations. To achieve this goal, we use direct observations of giant otter family groups and, in the future, camera traps. These methods are aimed at monitoring giant otter populations and examining differences in their survival and reproductive success between the protected Manu National Park and adjacent areas subject to mining and habitat degradation. Mercury, emitted to the environment in large quantities as a consequence of gold mining activities, can accumulate in animal tissues and, at high levels, become toxic. Freshwater fish of varying sizes are the main component of giant otter diet. In collaboration with researchers at the Centro de Innovación Científica Amazónica (CINCIA), we plan to sample sediments and fish in the seasonal lakes inhabited by giant otter family groups in order to estimate mercury levels. To complement this environmental assessment, we intend to collect giant otter hair samples and examine possible effects of mercury on health and behavior. Manu National Park contains indigenous Amazonian tribes of varying contact levels. Working from the Cocha Cashu Biological Station, we have a constant presence with these indigenous communities. Our team, composed of Peruvian and foreign researchers, frequently promotes workshops and community engagement opportunities. One of the recent significant contributions, aimed at improving local attitudes towards giant otters and the riverine environment, is the book “Tito and the Giant Otter” written both in Spanish and Matsigenka, one of the local indigenous languages.